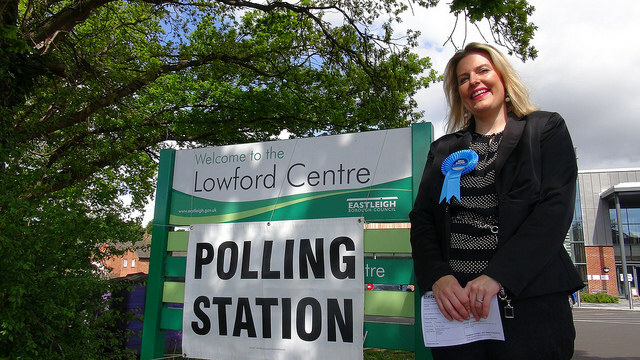 Godfrey Olson, the Leader of Eastleigh Borough Council’s Conservative Group has declared that the party is ‘on the way up’ after Mims Davies became the constituency’s first female MP in the General Election and the Conservatives took two borough council seats. The General election results mirrored those for the rest of the country as the Conservatives swept back into power with an outright majority albeit a slim one. The result was unexpected as pollsters had predicted a hung Parliament. Nick Clegg had declared he needed 60 seats like Eastleigh but, fortunately for the Lib Dem leader, his losses were limited to just 49 parliamentary seats. Locally, all the parliamentary seats that had been Liberal Democrat are now Conservative. The Conservative Party had targeted Eastleigh as one of 23 seats they needed to win in order to secure an outright majority. Over the course of the campaign Conservative Central Office had carpet-bombed the constituency with a procession of cabinet ‘a listers’ including the the Chancellor of the Exchequer, the Foreign Secretary and the Prime Minister himself. It was an efficient tactic as Eastleigh was close to two other crucial Tory targets – Southampton Itchen and Portsmouth South – which meant that ministers could put in an appearance at all three during one trip South. It was also proved to be an effective tactic as all three seats fell to the Conservatives. In Portsmouth South, Flick Drummond beat Lib Dem turned Independent candidate Mike Hancock and in Southampton Itchen Royston Smith claimed retiring MP John Denham’s seat from Labour. The Lib Dems had already lost control of both the Winchester and Chandler’s Ford and the Romsey and Southampton North constituencies in 2010, these were comfortably held for the Tories by Steve Brine and Caroline Nokes. What was for the last 20 years an enclave of Liberal Democrat support has now turned Blue. Mims Davies, the youngest candidate to win Eastleigh since David Price in 1955, did so by the biggest majority since 1994 – a win made all the more remarkable as pundits, pollsters and bookies had all been predicating that 2013 by-election victor Mike Thornton would hold the seat with an increased majority but Davies seems to have turned what was a tough three-way marginal into a Tory safe seat with a 9,000 + majority. It’s conventional wisdom that high turnouts tend to favour the Conservatives and after polling stations closed on Thursday night the BBC Exit poll forecast a win for Davies but few at the Fleming Park count seemed to believe it. However when party tellers took sample observations during the lengthy ballot verification process it quickly became obvious that the Conservatives had achieved a remarkable victory and so before the actual counting even began most of the parties had conceded – some of the supporters heading home early. There was a strange sense of anticlimax, and a long wait until the 4 am declaration confirmed what everybody already knew – Eastleigh was back in Conservative hands after 21 years. Earlier Mike Thornton had entered the hall to warm applause from his party colleagues already knowing he had lost the seat and was one of the first to congratulate Mims Davies when she arrived. “Its been a great honour and a privilege to be the MP for Eastleigh over the last two years I feel that service is part of my make up and I’m glad the people of Eastleigh allowed me to fulfill that there are many things that I regret but I particularly regret not being able to finish my work on the mental health issues that were so important to me in parliament. “While George Osborne was last in Eastleigh a few weeks ago he promised the Conservatives would set the ball rolling on stalled local road projects – Thornton asked Mims to make sure he keeps his word. Thornton had not defended his Bishopstoke council seat and although he remains a Bishopstoke Parish Councillor this role is unpaid. 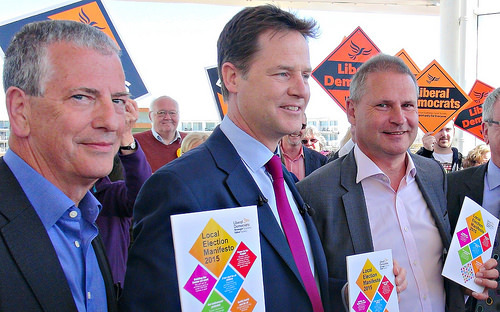 L-R Ex Mp Mike Thornton, Ex Lib Dem Leader Nick Clegg and Keith House. The ex MP said that he is leaving Parliament with just the equivalent of a couple of months pay and is now looking for a job. Speaking to Eastleigh News after the count Thornton said he thought the collapse in the Lib Dem vote was due to voters, including Lib Dem supporters, tactically voting Conservative due to fear of a minority Labour government gaining power with the help of left wing Scottish Nationalists. Patricia Culligan was also philosophical in defeat . 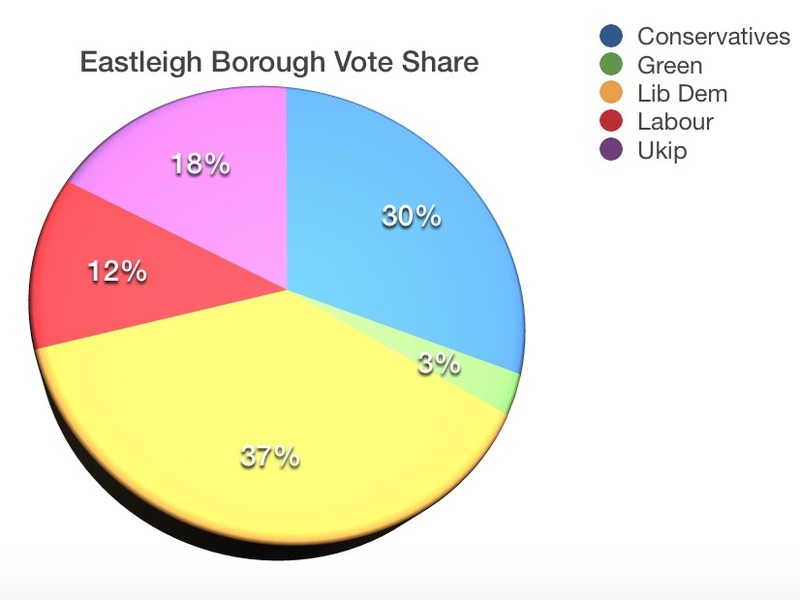 Ukip have been the fastest growing party in Eastleigh, their vote had increased dramatically in 2013 when their candidate Diane James came a close second. The party only needed a 3% swing to win the seat but crucially, this year, Ukip’s vote share dropped to 16%. As a candidate Culligan had shown that she was an accomplished speaker and presenter but she simply didn’t have the resources and support that Diane James had access to during the by-election. An injudicious and inaccurate tweet mid-campaign also resulted in her keeping a lower social media profile, although it is unlikely it made much difference to the overall result. Prior to the count an Eastleigh Ukip activist told me he expected the party to win here and in addition up to 20 seats nationwide – as well as winning 3 to 5 Eastleigh Borough Council seats but in the end it was a disappointing night for them as they won none of the seats they contested here – not even at parish level – and lost one of their two parliamentary seats despite polling 3.8 million votes nationally. After the results were in a local Ukip insider said that the party had cost the Conservatives more seats on the council by splitting the Tory vote in seven wards. In the General Election the Labour Party failed to displace the Tories after losing 48 seats – despite media predictions forming a coalition with the Scottish Nationalists would have been a luxury. “We think we have left base camp , we can see where the summit is. “We’ll be campaigning for things like a community hospital at Moorgreen. Mark Latham also told Eastleigh News that he intended to re-contest the seat the next General Election. Nationally the Green Party managed to poll over a million votes but could not increase their presence in Westminster beyond their single MP Caroline Lucas. In Eastleigh the Greens polled 2.7% of the vote with 1,513 votes. 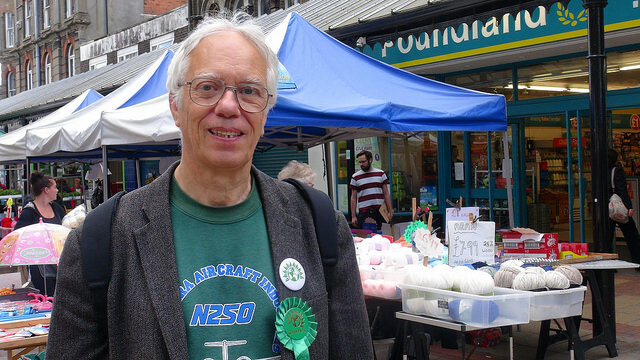 “As you know the Greens haven’t stood in Eastleigh for a very long time we’ve hit three percent of the vote, which is a great improvement over nothing. In 1994 Eastleigh by-election the Ukip candidate, an unknown Nigel Farage, polled just 952 votes so Meldrum has grounds for optimism. The Beer, Baccy and Scratchings Party founder and candidate Ray Hall said he was disappointed to have polled less than his 2013 tally of 235 votes. This year there were more spoilt papers than votes for the Beer and Baccy man and Hall wondered if it was due to the enforced name change. The party had not been invited by the Kings Community Church to their Hustings in Hedge End – a decision branded as ‘disgusting’ by BB&S assistant Ray Turner. Another party which had been also excluded was the Trade Unionist and Socialist Coalition (TUSC). After a low key campaign Declan Clune polled 114 votes although this was an improvement on the 62 votes they polled in 2010. The anti-austerity party did not win any seats nationally polling around 36,000 votes. At the declaration a TUSC representative thanked all those who had voted and congratulated Mims Davies on her win. In the local Borough elections 14 of the 44 ward seats were being contested. The Liberal Democrats held 39 seats the Conservatives 4 and one seat – Hedge End Wildern was vacant following the surprise resignation of former Lib Dem Councillor Jenny Hughes last year. The Conservatives gained two seats from the Liberal Democrats. In Hamble Elizabeth Lear unseated long serving Councillor Malcolm Cross who was Mayor of Eastleigh in 2013. Fellow Conservative Jerry Hall regained Hedge End St Johns ward – a seat he lost some years ago, unseating Lib Dem Mick Wheatley in the process. A delighted Jerry Hall also took the St Johns seat on Hedge End Town Council. Mims Davies’s campaign manager Frair Burgess came close to winning Bursledon. There were just 40 votes between Burgess and the Lib Dem Candidate, Eastleigh cabinet member Tonia Craig but Burgess won a seat on Bursledon Parish Council – which remains under Lib Dem control. 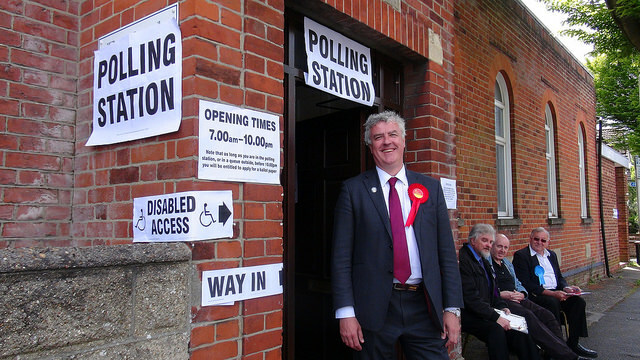 Burgess is the sole Conservative member on Bursledon Parish Council and sits with two Independents: Mark Garrett and Ron Nichols and also Diane Andrewes who is the only Labour party councillor to have been elected in Eastleigh this year. At Hedge End Town Council the sole independent and one man opposition member Keith Day lost his Wildern seat but the Conservatives including Jerry Hall took four from the Lib Dems. Day who blogs on Hedge End matters as Hedgeendblogger also failed in an attempt to win back the Wildern borough seat which he had formerly held as first as a Lib Dem then as an Independent. The seat was won by Emma Norman – technically a gain for the Lib Dems. Labour’s Candidate in Wildern, Andrew Helps told Eastleigh News that despite losing he was pleased to have tripled his vote over 2014. 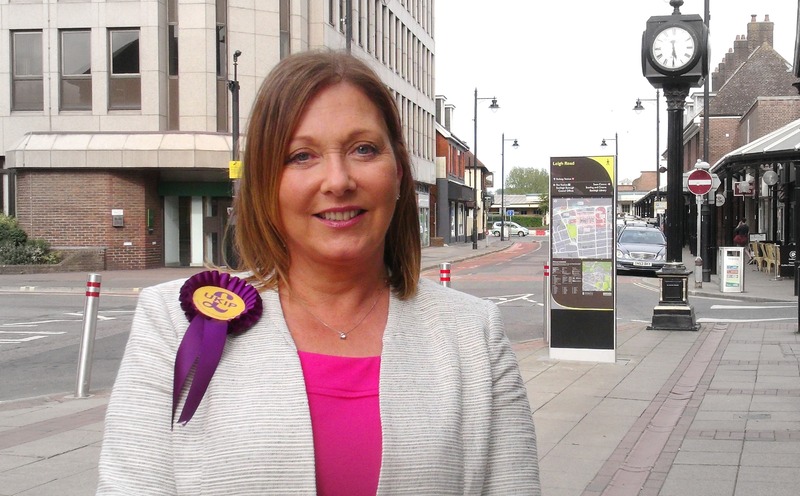 Although Ukip had done very well in the 2013 county elections by winning three seats off the back of a close run by-election – they were unable to maintain this momentum and win any borough seats in the 2014 local elections even though they captured 25% of the vote and came second in 11 of the 14 wards they contested. This year their share of the local vote fell back to 18% and they were runners up in just three seats the most bitterly contested being Eastleigh South where Jim Saunders exchanged blows on social media with Paul Bicknell, the Lib Dem candidate standing for re-election whom Saunders said had ‘betrayed’ local residents by voting in favour of the council’s local plan which would see hundreds of new homes built on green fields in Eastleigh South. The Lib Dems retaliated describing Saunders – who lives in Horton Heath – as a “Durley resident”. There were some acrimonious tweets between the two rivals but in the end Bicknell was re-elected and Saunders was runner up, losing by a larger margin than he did when he stood in Eastleigh South last year. Green field development was also an issue in Fair Oak and Horton Heath where the incumbent Lib Dem councilor Roger Smith had come in for criticism because developers Bloor have an interest in land owned by him. This a matter of public record and is declared in the councillor’s register of interests but is clearly still an issue for some residents opposed to large scale housing development in the area. Even so, Smith was again returned as Councillor. Both the chair of Eastleigh Ukip Glynn Davies-Dear and the Ukip County Councillor for Eastleigh East Andy Moore tried to win back borough seats they formerly held as Lib Dems in Eastleigh North and Eastleigh Central. However both seats were held by the Lib Dems – Sarah Bain taking the place of long serving Peter Wall who has retired and Keith Trenchard held on in Central for his second term. This was the third attempt by Moore and Davies-Dear to regain their former wards having previously tried last year for Ukip and in 2011 as Independents. Labour did not threaten in any of the Borough seats they contested but their candidates experienced an increase in their vote share which rose from 10% to 12% overall. The composition of Eastleigh Borough Council is now 38 Liberal Democrats and 6 conservatives leaving the Council in Liberal Democrat control. Newly re-elected Lib Dem Councillor Keith Trenchard described the loss of two Borough seats as a “small setback”. Overall it seems that Eastleigh voters have ‘split voted’ across the General and local election – punishing the Lib Dems nationally with tactical voting. Mims Davies also proved to be a strong candidate, well supported by her party. Locally though, the Lib Dems still have strong support from many residents who are happy with the way their local council is run, even though there are concerns over development in some communities. 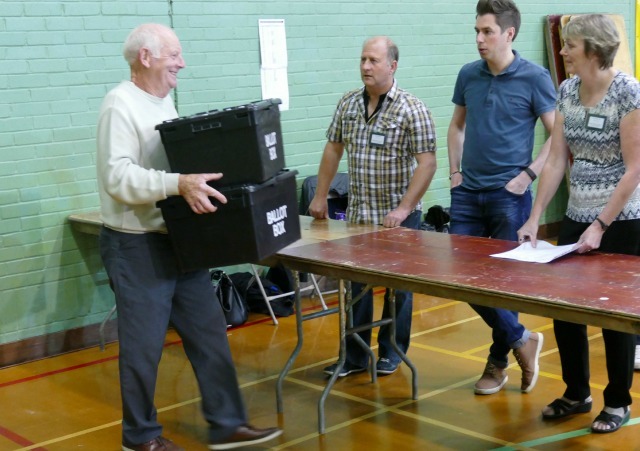 The result was that in the parliamentary election the conservatives polled 23,464 votes but took 7,563 fewer votes in the borough election where the Lib Dems gained an additional 5,064 votes. It’s worth noting that while the Liberal Democrat vote share fell by 7 percentage points in the General Election their local vote share is static at around 37% while the Conservatives saw their GE and local vote share both rise by 10 percentage points giving them 42% in the GE and 30% in the Borough Election. Despite this the Conservatives have increased their representation from ‘toehold’ to ‘footprint’ in the council chamber and their new MP has told Eastleigh News by campaigning on issues like congestion, pollution and local NHS provision she hopes to win more seats for the Conservatives on the Council. In Chandler’s Ford – the part of the Borough that is part of the Winchester parliamentary constituency – Conservative Steve Brine increased his majority with a 6.5% swing. Liberal Democrat candidate Jackie Porter – a Hampshire County Councillor – came second but with a vastly reduced vote over the 2010 result despite being one of the Lib Dem candidates selected by Lord Oakeshott for financial backing. The Ukip candidate was Fair Oak County Councillor Martin Lyon who finished fourth but with 5.4% increase over Ukip’s 2010 result. 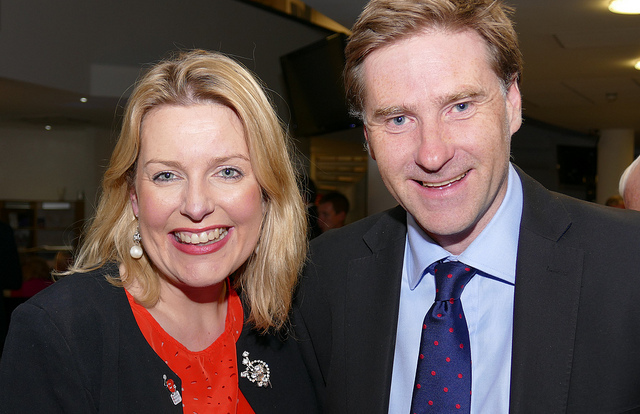 Eastleigh’s MPs Mims Davies and Steve Brine are both former BBC journalists. So much for “Left wing media bias” eh? Elsewhere Eastleigh Lib Dem Councillor for West End North Bruce Tennant came fourth after standing in New Forest East and the former Lib Dem Councillor for West End South Dave Goodall saw a spectacular collapse in the Lib Dem vote on the Isle of Wight experiencing a negative swing. Goodall finished fifth behind Conservative Andrew Turner (who retained his seat), Ukip, The Green Party and Labour. In 2010 the Lib Dems were second with 22,000 votes, this has been reduced to 5,000 votes, a -24% swing. “We are happy we have now got a Conservative Member of Parliament. How many times can you say ‘Eastleigh’ in 30 seconds?